Who would have thought that Salthouse Boatbuilders would be the hub of creation when it comes to Vakas? But when offered the chance to be involved in this exciting Pacific Voyagers Project, we gladly took the opportunity of producing seven twin hull vessels. 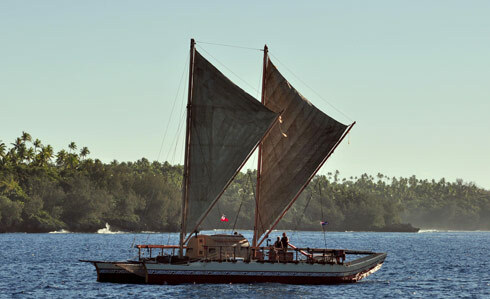 The aim of the Pacific Voyagers Project is to develop the awareness and preservation of the ocean environment and marine life by recapturing the Polynesian traditions of ocean voyaging between the island nations of American Samoa, the Cook Islands, Fiji, Tahiti, New Zealand, Tonga and Western Samoa. Needless to say, building twin hull Vaka's has been a little out of the ordinary for the Salthouse yard but it has been a fascinating process to combine today's modern technologies of boatbuilding with those traditional methods of the Polynesian culture. Each hull is constructed of e-glass and foam using advanced infusion processes. In contrast to these modern methods, tradition remains clearly visible with each hull lashed together using wooden beams and ropes. Authenticity has been maintained with the Vaka adorned in traditional carvings, colourings and insignia of each individual nation, resulting in an impressive fleet for the Pacific Voyagers to be proud of. It has been a true honour for Salthouse Boatbuilders to be part of such a unique project and to have the opportunity to witness the cultural and traditional connection the island nations have with the sea and each other.